Description: Trailing unit on MOAY. Title: My First All Pan Am Lashup! Description: PORU with MEC 350 - B&M 327 - MEC 511 had alot of switching to do at Rigby Yard on this frigid afternoon before departing much later that night. Here we see two Phase 2 painted GP40's paired with a Phase 1 painted GP40-2W kicking cars around the yard. Description: Fourth engine on SEPO. Title: The FRA Is In Town! Description: A zoom shot showing modern and not-so-modern at the B&M/Guilford/PanAm yard at East Deerfield MA. Description: Doing some switxhing at the yard. Description: Pan Am borrows vests too. That is a CSX vest! Description: Long zoom into Pan Am's East Deerfield MA yard showing recently painted (and already dirty) EMDs. Description: Doing some west end switching. Description: 350 heads out to switch the scrapyard just west of the yard. Description: After switching the scrapyard, 350 returns shoving loaded cars. Description: MEC 350 works Merrill's on a beautiful Saturday afternoon. Description: A beautiful summer sunset is seen over RUPO as it makes its way towards Rileys with a good sized train. Seen in Canton Maine. Description: A late-running PL-1 dashes north across the Farmington River on Amtrak's Springfield after an extensive wait in the Hartford Yard for trains 57 and 464. Description: Train PL-1, this day with MEC 350 for power, sorts empty LPG tank cars in the Plainville Yard as National Eastern Steel's travel crane looks on. 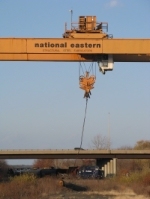 The crane still sits in the yard even though the company closed a few years ago. Description: MEC 350 leads train PL-1 northbound across the Connecticut River. The fifteen car train is bound for the East Deerfield Yard from Plainville, CT.